Leukocytes are key components of the body’s defense system and the major subsets of leukocytes are granulocytes and lymphocytes. We and others have found that the distribution of these subsets are under the regulation of the autonomic nervous system. 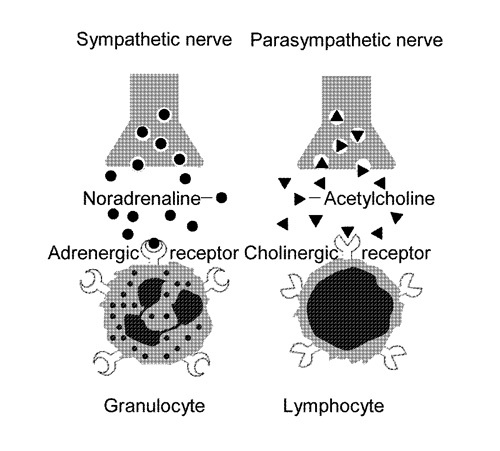 Of note, granulocytes express adrenergic receptors and the number and proportion of granulocytes increase by a stimulation of the sympathetic nervous system. Indeed, there are several physiological variations of leukocytes, including neonatal granulocytosis, due to the sympathetic nerve activation by the onset of pulmonary respiration, and a circadian rhythm of granulocytes and lymphocytes (i.e., granulocytosis at daytime and lymphocytosis at night). Severe granulocytosis induced by stress is also associated with the onset of tissue-destructive and autoimmune diseases. We reveal herein that the onset of many common diseases in humans is intimately related to their lifestyle, stress, the subsequent sympathetic nerve activation and granulocytosis. It is well established that leukocytes play a major role in our body’s defense system. The most fundamental subset of leukocytes is macrophage (monocytes in the blood). By a phylogenic development, additional subsets of leukocytes are generated, including granulocytes and lymphocytes. In humans, granulocytes represent the major subset of leukocytes in the blood (approximately 60%) and are associated with the defense against bacteria by phagocytosis. As a result, granulocytes are related to purulent inflammation. Our recent studies indicate that the leukocyte distribution in the blood and tissues is under the regulation of the autonomic nervous system [1–4]. We have found that all subsets of leukocytes express both adrenergic and cholinergic receptors on their cell surface [5, 6]. However, there is a tendency that granulocytes express much more adrenergic receptors, whereas lymphocytes express much more cholinergic receptors. In the light of these findings, we then observed physiological variations of the leukocyte distribution in the blood both in humans and mice. In particular, the proportion of granulocytes and lymphocytes vary with the circadian rhythm . For example, the number and proportion of granulocytes increase at daytime (sympathetic nerve dominance), whereas those of granulocytes decrease at night (parasympathetic nerve dominance) . In addition to these physiological responses of leukocytes, there are many stress-associated responses of leukocytes, including both granulocytes and lymphocytes. Some of these responses are linked with the onset of common human diseases. Indeed, stress-induced granulocytosis is associated with many tissue-destructive diseases. 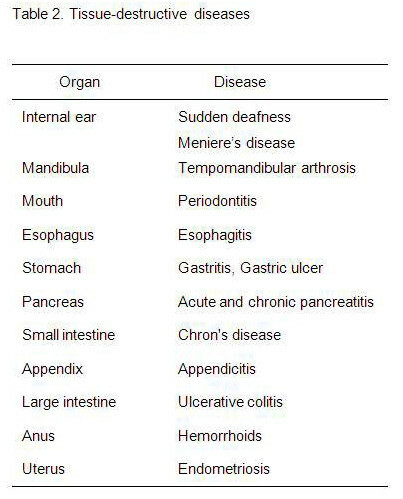 Such diseases include sudden deafness, periodontitis, gastritis, ulcerative colitis, hemorrhoids, endometriosis, etc. In this review, we discuss how granulocytes are regulated by the autonomic nervous system and are associated with the onset of common human diseases. It is a widely known by clinicians that neonates show granulocytosis [9–11]. In newborn animals and humans, granulocytosis is consistently observed in the blood and it persists for two to three days after birth. However, it was not known whether such granulocytosis is seen before birth. We studied this issue in mice and humans . In mice, granulocytosis was not seen before birth (Fig. 1). This result suggests that neonatal granulocytosis is induced by the onset of pulmonary respiration. A similar result was also observed in humans . In other words, granulocytosis was not seen in the cord blood of newborn babies. However, just after birth, granulocytosis appeared in the blood of newborns. Thus, it is conceivable to suggest that the oxygen stress, associated with the onset of pulmonary respiration induces sympathetic nerve activation and results in granulocytosis. This granulocytosis is seen in the liver, as well as, in the circulation. It appears that one of the tissue destructions is in the liver of neonates, where the destruction of fetal hematopoiesis takes place. Such destruction then produces neonatal jaundice at ten days after birth. Sympathetic nerve activity is dominant at daytime. In fact, the levels of adrenaline and noradrenaline (the major catecholamines) in the blood are high during the daytime and low at night [7, 8]. Thus, a steady rise and fall pattern of catecholamines is maintained at daytime and night in the blood, respectively. In contrast, the parasympathetic nervous system demonstrate a rhythm of low activity during the day and high activity during nighttime. How does the level of granulocytes and lymphocytes change in relation to these rhythms in the sympathetic and parasympathetic nerve activity? Our studies indicate that the level of granulocytes is high during the day and low at night. The lymphocytes are inversely low during the day and high at night [7, 8]. The reason why the body can have such a rapid fluctuation in these levels is due to the short life-span of leukocytes, in particular granulocytes. The life-span of granulocytes is approximately 2 days after the migration from the bone marrow. In other words, the speed at which granulocytes are produced in the bone marrow and the speed at which they are distributed to the peripheral areas make this possible. The level of granulocytes which is under the control of the autonomic nervous system is quickly modulated given the short life-span of these cells. In most people, the white blood cells are approximately 60% granulocytes and 35% lymphocytes and the remaining 5% are macrophages. This is the average composition of leukocytes in the peripheral blood stream of healthy adults. We have recently demonstrated that the number of granulocytes increases as a function of age, whereas the number of lymphocytes decreases with aging . 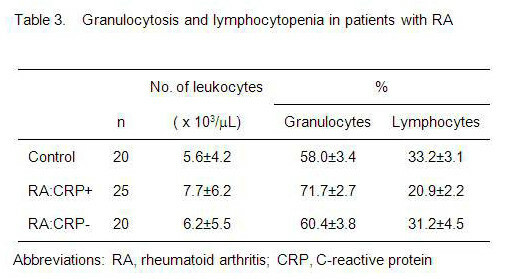 In Table 1 the proportions of granulocytes and lymphocytes are shown in middle-aged persons (42 to 64 years old) and centenarians (>100 years old). Of note, healthy centenarians still keep a considerably high proportion of lymphocytes (around 27%). One of the possible reasons for the age-related changes of such distribution is the age-dependent predominance of sympathetic nerve function. Thus, there is a tendency that aged persons have a gradual increase of the levels of the pulse rate and blood pressure. An additional factor might be the oxidation of molecules, elevated with aging and this phenomenon might stimulate as well the activity of the sympathetic nervous system. Recent evidence indicates that granulocytosis is induced by acute or chronic stress [14–17]. 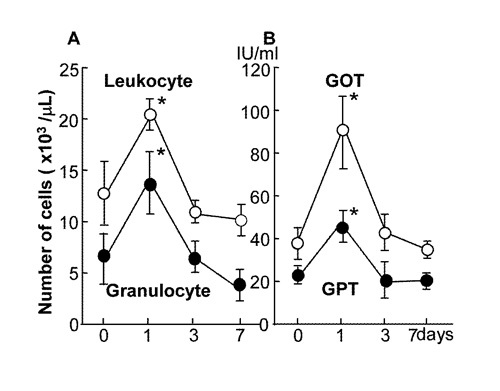 When mice were exposed to restraint stress, granulocytosis was seen in the blood and liver at 8 hours after stress (Fig. 2). At this time, the number of granulocytes decreased in the bone marrow. This was due to pooled granulocytes in the bone marrow being released into the circulation. Finally, these granulocytes reached the mucosal tissue in the stomach at 24 hours after stress. This phenomenon is most likely related to the formation of gastric ulcers. Stress and subsequent granulocytosis are also associated with many mucosal diseases such as periodontitis, gastritis, Crohn’s disease, ulcerative colitis, hemorrhoids and endometriosis. The types of stress affecting humans include overwork, mental distress, body chilling, obesity, etc. Leukocytes distribution in the blood of healthy persons is regulated by the autonomic nervous system [5, 6]. This is due to the presence and expression of adrenergic receptors on granulocytes and of cholinergic receptors on lymphocytes (Fig. 3). Figure 3. Adrenergic receptors on granulocytes and cholinergic receptors on lymphocytes. Granulocytes and lymphocytes are generated from macrophages in the phylogenetic development. The most basic leukocyte population (i.e., macrophages in the tissues and monocytes in the blood) bears both types of receptors on the cell surface. Thus, the number of granulocytes increases in conditions associated with a stressful lifestyle, whereas that of lymphocytes increases in those with a less stressful lifestyle and less physical activity. Before our first paper, there had already been several papers in which the existence of adrenergic receptors on granulocytes [18, 19], and of cholinergic receptors on lymphocytes [20–22] were reported. However, the reciprocal regulation between granulocytes and lymphocytes by the autonomic nervous system was not reported in those papers. In this section we reveal that the prolonged administration of non-steroidal anti-inflammatory drugs (NSAIDs) may act as a substantial stress in patients. NSAIDs are very popular medicines and are widely used for pain, swelling and fever in patients. Such actions are produced by a suppression of prostaglandin synthesis [23, 24]. However, in parallel with these functions, NSAIDs stimulate the secretion of catecholamines . Thus, NSAIDs also stimulate sympathetic nerve activation, and subsequently induce granulocytosis (Fig. 4). Figure 4. Granulocytosis induced by NSAIDs. Indomethacin (0.5 mg/day/mouse) was administered every day for a week. Two-color staining for Gr-1 and Mac-1 was conducted to detect granulocytes (Gr-1+Mac-1+). Therefore, the phenomenon of granulocytosis may represent a generalized response in the whole body. This may represent one mechanism explaining why patients using NSAIDs for a long time, in certain diseases may also suffer from the tissue-destructive diseases such as esophagitis, gastritis, colitis, hemorrhoids, etc. In the case of the patients with ulcerative colitis, the administered NSAIDs are absorbed in the colon (e.g., salazosulfapyridine and mesalazine). Thus, a long-term administration of NSAIDs sometimes may worsen the disease. This is one of the mechanisms of the onset of NSAID enteritis [26–29]. In addition to granulocytosis, we should pay attention to vessel constriction and circulation failure induced by NSAIDs. Hence, if a patient suffering from pain uses for a long period of time a cold compress that contains NSAIDs, this could lead to circulatory complications. Here we discuss the mechanism of the onset of tissue-destructive diseases. For this purpose, one should take into account the regulation of leukocytes’ distribution by the autonomic nervous system. As mentioned above, granulocytes bear adrenergic receptors on the cell surface, and are activated in number and function by sympathetic nerve stimulation . On the other hand, lymphocytes bear cholinergic receptors on the cell surface and are activated by parasympathetic nerve stimulation . Although granulocytes are important for the phagocytosis of bacteria, and in most cases are protective, the excess number of granulocytes in some conditions might be harmful. For example, if an individual is subject to a hard work or stress, associated with high sympathetic nerve activity, the ratio and absolute number of granulocytes may increase significantly (e.g., 60%→80%). At that time, a large number of granulocytes migrates from the bone marrow to the mucosa of the digestive tract and interacts with resident bacteria. Such interaction then induces the tissue-destructive diseases such as gastritis, ulcerative colitis, periodontitis, hemorrhoids, etc (Table 2). If granulocytosis is severe, tissues where resident bacteria is extremely few, become also the targets of tissue destruction (e.g., sudden deafness, pancreatitis, endometriosis, etc). Some concepts about the mechanisms of the onset of autoimmune diseases probably should be reconsidered. Thus, many investigators and clinicians have long believed that self-reactive forbidden clones, which evoke autoimmune or collagen diseases, may be generated through failure in T-cell differentiation in the thymus. However, we were not able to observe such failure of intrathymic T-cell differentiation [30, 31]. 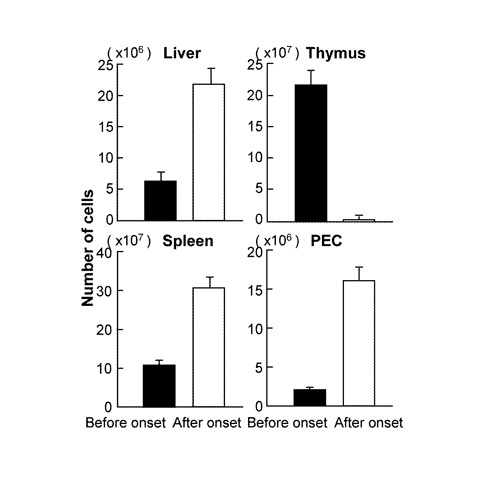 In the autoimmune prone NZB/W F1 mice, severe thymic atrophy is rather induced at the onset of disease (Fig. 5). This result suggests that the mainstream of T-cell differentiation is arrested under autoimmune conditions . Inversely, the number of lymphocytes in the liver (consisting of extrathymic T cells) and that of peritoneal exudate cells (consisting of autoantibody-producing B cells or B-1 cells) increase. In other words, extrathymic pathway of T-cell differentiation, which primarily produces self-reaction forbidden clones, without negative selection is activated in autoimmune diseases or collagen diseases. Reflecting these conditions, we have observed that lymphocytopenia (consisting of conventional T and B cells) and granulocytosis (resulting from a sympathetic nerve stimulation) are common phenomena in patients with rheumatoid arthritis (Table 3). Similar phenomena are also seen in patients with other autoimmune diseases or collagen diseases (e.g., systemic lupus erythematosus, Hashimoto’s disease, scleroderma, Behcet’s syndrome, etc). There are two major factors that are involved in the induction of autoimmune or collagen diseases, namely 1) infections and 2) mental or physical stress (Table 4). When the viral or bacterial infection is severe, tissue damage is evoked by inflammation. Such tissue damage induces sympathetic nerve activation and results in granulocytosis and primitive lymphocytes (i.e., innate immunity). If the tissue damage persists, activated granulocytes produce superoxides, as well as many inflammatory cytokines (e.g., TNF-alpha, IFN-gamma, and IL-6) that further accelerate the tissue damage. At this time, primitive lymphocytes such as extrathymic T cells (i.e., CD56+T or CD57+T cells in humans) mediate autoreactivity against denatured self-tissue and B-1 cells produce autoantibodies . These responses are sometimes beneficial, for the elimination of denatured self-cells, or may become harmful, and thus may accelerate the tissue damage. Similarly, mental or physical stress may also be involved in the induction of autoimmune diseases, as stress is known to induces sympathetic nerve activation. Such sympathetic nerve activation then induces granulocytosis and results in tissue damage. Indeed, we are often able to observe such mental and physical stress (e.g., overwork) at the onset of the disease in patients with autoimmune conditions. Sympathetic nerve activation also induces thymic atrophy which indicates the arrest of the mainstream of T-cell differentiation in the thymus [34–36]. Inversely, primitive lymphocytes such as NK cells, extrathymic T cells and autoantibody-producing B-1 cells (i.e., constituents of innate immune system) are activated. Again, these responses are not always harmful for our body, because these cells are responsible to the elimination of abnormal or denatured self-cells. A similar opinion is also proposed by other investigators . We also consider that an appropriate level of autoreactivity mediated by primordial T and B cells is often essential to protect living beings from stress or intracellular infections. It is concluded that the autonomic nervous system controls the leukocyte distribution in the circulation and the whole body. However, under certain conditions, and when an individual is exposed to severe stress, the sympathetic nerve system becomes activated, and this subsequently triggers granulocytosis. This process and phenomenon may be intimately related to the onset of several tissue-destructive diseases in humans. This work was supported by a Grant-in-Aid for Scientific Research from the Ministry of Education, Science and Culture, Japan. The authors wish to thank Mrs. Yuko Kaneko for preparation of the manuscript. Abo T, Kawamura T, Kawamura H, Tomiyama-Miyaji C, Kanda Y. Relationship between diseases accompanied by tissue destruction and granulocytes with surface adrenergic receptors. Immunologic Res 2007; 37: 201–210. Tsuchida M, Nagura T, Bai X, Li C, Tomiyama-Miyaji C, Kawamura T, Uchiyama M, Abo T. Granulocytic activation and reciprocal immunosuppression induced by dehydration: relationship with renal failure. Biomed Res 2004; 25: 171–178. Sagiyama K, Tsuchida M, Kawamura H, Wang S, Li C, Bai X, Nagura T, Nozoe S, Abo T. Age-related bias in function of natural killer T cells and granulocytes after stress: reciprocal association of steroid hormones and sympathetic nerves. Clin Exp Immunol 2004; 135: 56–63. Abo T, Kawamura T. Immunomodulation by the autonomic nervous system – therapeutic approach for cancer, collagen diseases, and inflammatory bowel diseases. Therapeutic Apheresis 2002; 6: 348–357. Toyabe S, Iiai T, Fukuda M, Kawamura T, Suzuki S, Uchiyama M, Abo T. Identification of nicotinic acetylcholine receptors on lymphocytes in the periphery as well as thymus in mice. Immunology 1997; 92: 201–205. Suzuki S, Toyabe S, Moroda T, Tada T, Tsukahara A, Iiai T, Minagawa M, Maruyama S, Hatakeyama K, Endo K, Abo T. Circadian rhythm of leukocytes and lymphocyte subsets and its possible correlation with the function of autonomic nervous system. Clin Exp Immunol 1997; 110: 500–508. Abo T, Kawate T, Itoh K, Kumagai K. Studies on the bioperiodicity of the immune response. I. Circadian rhythms of human T, B, and K cell traffic in the peripheral blood. J Immunol 1981; 126: 1360–1363. Kawate T, Abo T, Hinuma S, Kumagai K. Studies of the bioperiodicity of the immune response. II. Co-variations of murine T and B cells and a role of corticosteroid. J Immunol 1981; 126: 1364–1367. Robinson WA, Mangalik A. The kinetics and regulations of granulopoiesis. Semin Hmatol 1975; 12: 7–25. Boxer LA. Diseases of the blood; in Behrman RE (ed): Nelson Textbook of Pediatrics. 14th ed., Philadelphia, PA, WB Saunders, 1992; 1264–1266. Lim FT, van Winsen L, Willemze R, Kanhai HH, Falkenburg JH. Influence of delivery on numbers of leukocytes, leukocyte subpopulations, and hematopoietic progenitor cells in human umbilical cord blood. Blood Cells 1994; 20: 547–558. Kawamura T, Toyabe S, Moroda T, Iiai T, Takahashi-Iwanaga H, Fukuda M, Watanabe H, Sekikawa H, Seki S, Abo T. Neonatal granulocytosis is a postpartum event which is seen in the liver as well as in the blood. Hepatology 1997; 26: 1567–1572. Miyaji C, Watanabe H, Minagawa M, Toma H, Kawamura T, Nohara Y, Nozaki H, Sato Y, Abo T. Numerical and functional characteristics of lymphocyte subsets in centenarians. J Clin Immunol 1997; 17: 420–429. Fukuda M, Moroda T, Toyabe S, Iiai T, Kawachi Y, Takahashi-Iwanaga H, Iwanaga T, Okada M, Abo T. Granulocytosis induced by increasing sympathetic nerve activity contributes to the incidence of acute appendicitis. Biomed Res 1996; 17: 171–181. Yamamura S, Arai K, Toyabe S, Takahashi EH, Abo T. Simultaneous activation of granulocytes and extrathymic T cells in number and function by excessive administration of nonsteroidal anti-inflammatory drugs. Cell Immunol 1996;173: 303–311. Tsukahara A, Tada T, Suzuki S, Iiai T, Moroda T, Maruyama S, Minagawa M, Musha N, Shimizu T, Hatakeyama K, Abo T. Adrenergic stimulation simultaneously induces the expansion of granulocytes and extrathymic T cells in mice. Biomed Res 1997; 18: 237–246. Maruyama S, Tsukahara A, Suzuki S, Tada T, Minagawa M, Watanabe H, Hatakeyama K, Abo T. Quick recovery in the generation of self-reactive CD4low NKT cells by an alternative intrathymic pathway when restored from acute thymic atrophy. Clin Exp Immunol 1999; 117: 587–595. Ratge D, Wiedemann A, Kohse KP, Wisser H. Alterations of beta-adrenoceptors on human leukocyte subsets induced by dynamic exercise: effect of prednisone. Clin Exp Pharm Phys 1988; 15: 43–53. Murray DR, Irwin M, Rearden CA, Ziegler M, Motulsky H, Maisel AS. Sympathetic and immune interactions during dynamic exercise. Mediation via a beta2-adrenergic-dependent mechanism. Circulation 1992; 86: 203–213. Fuchs S, Schmidt-Hopeeld I, Tridente G, Tarrab-Hazdai R. Thymic lymphocytes bear a surface antigen which cross-reacts with acetylcholine receptor. Nature 1980; 287: 162–164. Richman DP, Arnason BG. Nicotinic acetylcholine receptor: evidence for a functionally distinct receptor on human lymphocytes. Proc Nat Acad Sci USA 1979; 76: 4632–4635. Richman DP, Antel JP, Burns JP, Arnason BG. Nicotinic acetylcholine receptor on human lymphocytes. Ann NY Acad Sci 1981; 377: 427–435. Vane JR. Inhibition of prostaglandin synthesis as a mechanism of action for aspirin-like drugs. Nature (London) New Biol 1971; 231: 232–235. 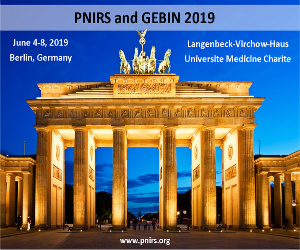 Abramson SB, Weissmann G. The mechanisms of action of nonsteroidal anti-inflammatory drugs. Arthritis Rheum 1989; 32: 1–9. Yamagiwa S, Yoshida Y, Halder RC, Weerasinghe A, Sugahara S, Asakura H, Abo T. Mechanisms involved in enteropathy induced by administration of nonsteroidal anti inflammatory drugs (NSAIDs). Digest Dis Sci 2001; 46: 192–199. Hashash JG, Atweh LA, Saliba T, Chakhachiro Z, Al-Kutoubi A, Tawil A, Barada KA. Acute NSAID-related transmural duodenitis and extensive duodenal ulceration. Clin Ther 2007; 29: 2448–2452. Kuroda M, Yoshida N, Ichikawa H, Takagi T, Okuda T, Naito Y, Okanoue T, Yoshikawa T. Lansoprazole, a proton pump inhibitor, reduces the severity of indomethacin-induced rat enteritis. Int J Mol Med 2006; 17: 89–93. Piepoli AL, De Salvatore G, De Salvia MA, Mitolo CI, Siro-Brigiani G, Marzullo A, Grattagliano I, Mitolo-Chieppa D, Palasciano G, Portincasa P. Indomethacin-induced ileitis is associated with tensiometric, vascular and oxidative changes in the experimental rat model. Eur J Clin Invest 2005; 35: 271–278. Jacob M, Foster R, Sigthorsson G, Simpson R, Bjarnason I. Role of bile in pathogenesis of indomethacin-induced enteropathy. Arch Toxicol 2007; 81: 291–298. Kawachi Y, Watanabe H, Moroda T, Haga M, Iiai T, Hatakeyama K, Abo T. Self-reactive T cell clones in a restricted population of interleukin-2 receptor beta+ cells expressing intermediate levels of the T cell receptor in the liver and other immune organs. Eur J Immunol 1995; 25: 2272–2278. Moroda T, Kawachi Y, Iiai T, Tsukahara A, Suzuki S, Tada T, Watanabe H, Hatakeyama K, Abo T. Self-reactive forbidden clones are confined to pathways of intermediate T cell receptor cell differentiation even under immunosuppressive conditions. Immunology 1997; 91: 88–94. Morshed SRM, Mannoor K, Halder RC, Kawamura H, Bannai M, Sekikawa H, Watanabe H, Abo T. Tissue-specific expansion of NKT and CD5+B cells at the onset of autoimmune disease in (NZB×NZW)F1 mice. Eur J Immunol 2002; 32: 2551–2561. Arai K, Yamamura S, Seki S, Hanyu T, Takahashi HE, Abo T. Increase of CD57+ T cells in knee joints and adjacent bone marrow of rheumatoid arthritis (RA) patients: implication for an anti-inflammatory role. Clin Exp Immunol 1998; 111: 345–352. Minagawa M, Narita J, Tada T, Maruyama S, Shimizu T, Bannai M, Oya H, Hatakeyama K, Abo T. Mechanisms underlying immunologic states during pregnancy: possible association of the sympathetic nervous system. 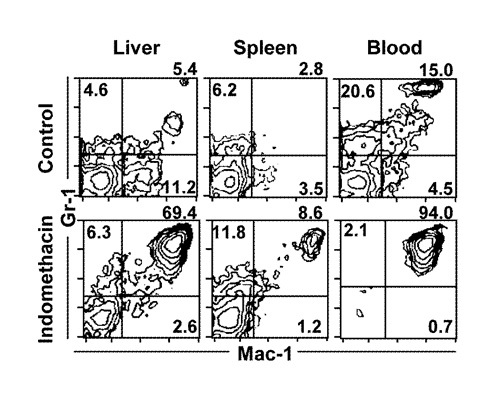 Cell Immunol 1999; 196: 1–13. Shimizu T, Kawamura T, Miyaji T, Oya H, Bannai M, Yamamoto S, Weerasinghe A, Halder RC, Watanabe H, Hatakeyama K, Abo T. Resistance of extrathymic T cells to stress and the role of endogenous glucocorticoids in stress associated immunosuppression. Scand J Immunol 2000; 51: 285–292. Abo T. Extrathymic pathways of T-cell differentiation and immunomodulation. Internat Immunopharmacol 2001; 1: 1261–1273. Schwartz M, Cohen IR. Autoimmunity can benefit self-maintenance. Immunol Today 2000; 21: 265–268. Source: Cover Image: Scanning electron microscope image from normal circulating human blood. Authors: Bruce Wetzel (photographer). Harry Schaefer (photographer). Credit: Wikimedia Commons.